Giant chess usually placed outside the room. This is because people often consider the size of chess that is more suitable to be placed outside. Giant chess is perfect for outdoor decoration, such as at patio area, garden area, backyard, hotel garden, public park, villa, camp ground, etc. Some people also put it at beautiful beach as giant chess game while they enjoy the summer holiday. Just like in the picture above. 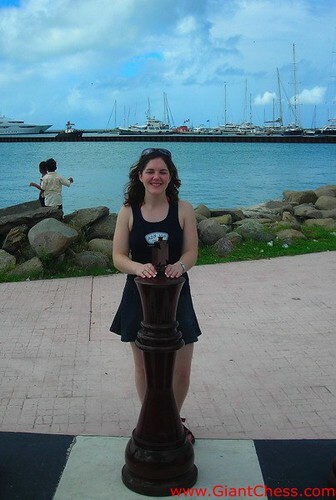 A woman hold a giant chess piece at the beach. The giant chess itself has made from best quality of Teak wood, so it often called as Teak giant chess. It special designed for outdoor use and make a stunning home or garden feature as a complete game of chess in any landscape plan, or as individual piece. You could even choose to use of Giant Teak chess piece purely as garden ornaments or outdoor chess game.